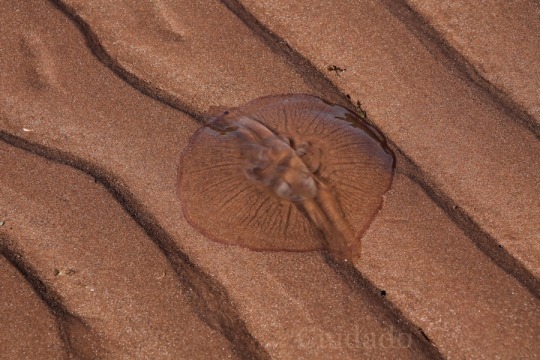 On a beach walk last week, I found two specimans of jellyfish, a tiny Lions Mane and a small clear Moon jellyfish. Jolies compositions. J'aime les dessins que laisse la mer sur le sable. Mary MacADNski: The beach does leave beautiful patterns. Thank you. Mary MacADNski: They are common bur manageable. Always surprising when looking at it Mary! Mary MacADNski: Not for me. It looked like an eye with lashes at first Martine. Mary MacADNski: Frank said the same. Mary MacADNski: One stings. One does not. I bet both give a nasty sting - as a swimmer in the ocean they are not my favourite aqua life, but they can be quite beautiful. Mary MacADNski: The purple one has a mild manageable sting. The moon, the clear one, does not sting at all. They are beautiful! The lower one can disguise itself very well in the sand. Mary MacADNski: Yes, and in water. It does not sting and is beautiful. Both seem aptly named - lovely images Mary. Mary MacADNski: I did not go in the water thou my friend was. She was seeing them swimming before they got stuck on land. Mary MacADNski: I can understand that from the thumbnails. Mary MacADNski: Thank you. Fascinating... I ate one in a Boston restaurant with a Chicago client...many years ago. They are very pretty, aren't they! I like your photo's - with the ripples of sand! Mary MacADNski: Thanks, I liked that ripply beach, a private one.